Adding more staff members is a great way to get acquainted with Re:amaze's notifications system and message distribution system. Because each staff member registers for Re:amaze using their own email address, they can easily receive notifications for incoming messages and customize their own experience inside the Re:amaze dashboard. To add a new staff, click on the "Settings" tab and click on "Staff" on the left hand side. 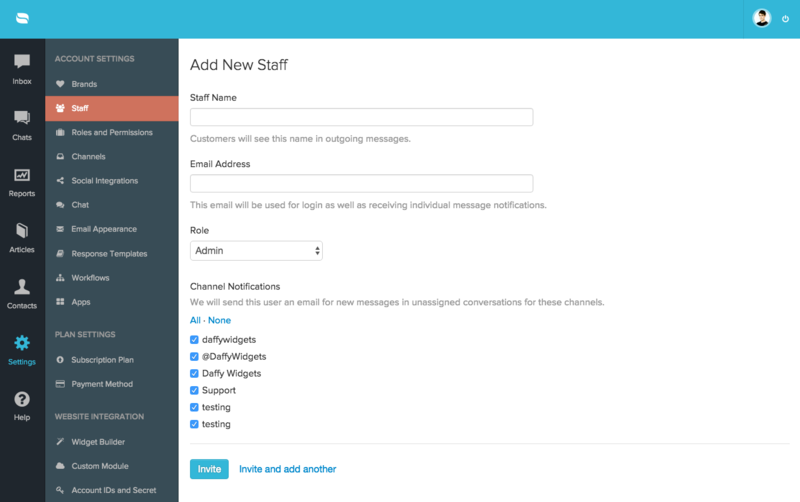 Input the name of the new staff member and enter the email you would like them to use for logging in. Ideally, this will be their work email (e.g sandy@acme.com) since they will be corresponding with customers using this email. Select the given role for the newly added staff. You can learn more about roles based access controls here: https://reamaze.reamaze.com/kb/video-tutorial-series/roles-and-permissions. Next, don't forget to pick which channels you want the staff member to monitor. Re:amaze will send notifications for new, unresolved messages. Re:amaze is unique in that customers never have to deal with just a "support" address. When they email "support@acme.com", Re:amaze distributes the message to individual staff members assigned to that channel. When staff members reply, you can pick whether customers see the staff name, your email channel name, or your brand's name, making for a more personable experience.